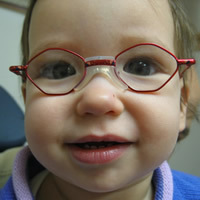 Our goal is to give children from all walks of life the highest level of eye care. The children’s optical service helps achieve that goal by providing excellence in dispensing children and infant with glasses and contact lenses. Our optical department provides a caring kid’s friendly environment, and has one of the largest inventories of children and infant frames, sport goggles and high quality U/V filter sunglasses. Our excellent staff is well trained and experienced in pediatric optical care, fitting glasses on wide variety of patients from infancy to teens. The children’s contact lens service is one of the best in the country, having a the capability to fit simple contact lenses in teens to even fitting new born infants with special contact lenses after cataract surgery. Our prices are very reasonable with special consideration to those families less privileged.